All e-hailing drivers (Grab, etc.) are now subject to the same regulations and requirements as taxi drivers as of April 6, 2018. This is according to caretaker prime minister Datuk Seri Najib Abdul Razak, who spoke at the presentation of the 1Malaysia Taxi Assistance Card at the Malaysia Agro Exposition Park Serdang (MAEPS). With this announcement, e-hailing drivers will need to undergo evaluations involving their background, traffic offences, health, training level and vehicle roadworthiness. Najib said the proposal for the new ruling was presented by then minister in the prime minister’s department Datuk Seri Nancy Shukri and the Land Public Transport Commission (SPAD), and has been approved by the Cabinet on April 6. The move has already been in the works since December last year, where discussions to replace/update the Public Service Vehicle (PSV) license were made, following amendments made to the Land Public Transport Act 2010 and the Commercial Vehicles Licensing Board Act 1987. “I instructed the enforcement through the gazetting which was done on the same day,” said Najib. 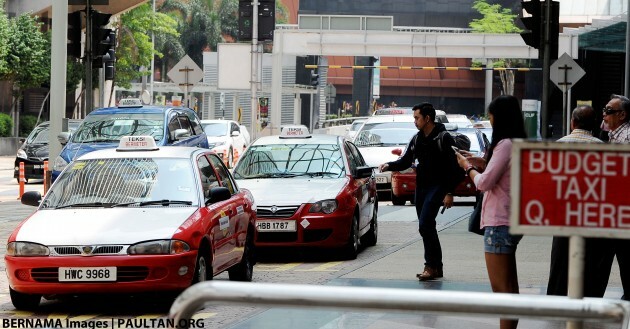 He also stated that since individual taxi permits were issued to taxis drivers whose lease agreements ended, 2,533 taxi drivers had been given their individual licences, while 643 government cash grants worth RM3.215 million had been channelled to eligible recipients. The government also approved a special grant of RM60 million to set up a Social Security Organisation (SOCSO) scheme to provide protection to taxi drivers, as revealed in Budget 2017. The scheme requires taxi drivers to make a minimum contribution of RM157, or RM13.08 a month. “The scheme provides cash benefits to taxi drivers and their dependents in the event of unforeseen occurrences such as accidents by providing medical treatment, physical rehabilitation or vocational training,” Najib explained. The new ruling is meant to promote fair competition among e-hailing and taxi drivers, with Najib saying the latter played an important role in highlighting Malaysia’s positive image to tourists as they were on the front line of the country’s tourism industry. “Be a taxi driver who is always friendly, honest and gives good service, then you can all be considered as Malaysia’s little ambassadors,” he said. Meaning ? To cheat ? Follow them taxi drivers ? Can grab now get cheap toll fares like taxi do? If not then its not fair to the grab driver as well. Good point, but I would have preferred the toll discount be in the form of rebate (which is to be matched with their trip instead) to avoid abuse. Similar case with Uber drivers in UK who abuse their minicab license to skirt around the £11.50 daily congestion charge to drive into London. then can grab driver get RM800 petrol card as well? I get that securities is one thing. Fair competition between Grab and Taxis? DEY. I remember that time when some taxi driver says come ride his blue car for a short ride. Are you bloody joking? Of course I know Blue cabs are expensive ones, and then I requested for the standard fare. He shooked his head, slammed the door and went back to puffing his smoke at the taxi stand. Dey! Then WHY DID YOU EVEN COME TO ME IN THE FIRST PLACE?! There are a few regular cabs around and you, the one with the luxury cab, is the one that sepakat to pick up customer? I swear that time I will never use roadside taxis ever again unless it is an emergency. Dah tak pandai jaga customer, buat pasal pulak. Perangai macam taik, handouts also cannot help. Hell, they even managed to injure themselves when given handouts. Ptui. Handouts and donation. Nrexit next. Grab and taxi cannot be using the same rules. Taxi can be an unsafe 20 yrs old car and still considered safe by the authorities. why 1992 iswara taxi still om the road? gov sked to ask taxi owners to dispose old & unsafe cars… nanti tak mau undi. harga taxi d kawal kerajaan. Grab should follow teksi tariffs. Hi Rony…. I paham oni “Grab should follow teksi tariffs.”…..
taxi fares is tooooooooo hiiiiiiiiigh!grab is the good choice! Now, PM want to angkat kaki Texi drivers for votes but he forget that Grab drivers also Voters. Oh I forget, Grab drivers are mostly educated ones that vote opposition so no petrol money for you unless you pledge to Vote BN. Grab drivers alredi in the bag when he legalise ride-share lah. PM FTW! Syukurlah PM bagi RM4,000 beli Iriz. Of cuz taximen will say its not suitable for their competitor service. U see uber ada complain tak? Topkek purple. I thought the introduction of Grab do away the usual poxy holding thousands of taxi licences. So it is fair for Grab as anyone can work and no longer a monpoly. have anyone calculate how many taxi drivers compare to e-hailing drivers? so jibby mau kempen ambil hari few thousand of taxis driver and complicating the life of ten of thousands e-hailing drivers? i use grab short trip only rm5 to rm10..comfy cars, nice music, free mineral water..
Oh come on !! Fair & level competition ?? Then let taxi follow grab fare !! they dunwan…nanti komplen takbole bayar sewa taxi, takbole bayar permit driver, tak boleh tukar tayar suda botak liao. nanti cakap kat pm anak bini tak cukup makan. at the mean time, Grab and Grab drivers are busy raking in more money without Uber. Want to save the taxi drivers? Easy. Hand out daily promo codes for the next 5 years and taxi drivers sure will have business and rakyat become happy. If your manifesto got this you could win the next election but youre only talking about the interests of taxi drivers, taxi companies and not so much about public interests..
Come on la, handing out benefits to taxi drivers might as well hand out promo codes to score votes..
Did that rules…then i will change cabinet…wait PRU13…. More government intervention will only result in worse result for public transport. You can sort of speculate where the taxi industry is heading. It will become extinct due to government reluctance to open up the market so that only those who are interested to work get a licence instead of being sold in batches to crony members. Just look at our buses, where are them now? Government want to control the market so much that only their crony members will get monopoly but each and every time it had proven that crony only wants easy money by milking those who are doing the hard work. They are not there because they are interested in providing the services. but u cannot change the mindset of common taxi driver have dude. sijil belambak pon tarak guna. To our PM, go undercover and try out grab and normal taxi for one or two weeks, then tell the rakyat what’s the difference. there’s no point e-hailing drivers to pay all hassle to get passengers. Will Grab charge extra if caught in traffic jams? It’s fix rate regardless how heavy the jams is…whereas in jam taxi meters still ticking away!!! Thank you PH minister….you r so full of wisdom. To all Grabbers when the time comes we should organize full boycott on normal taxi cars..